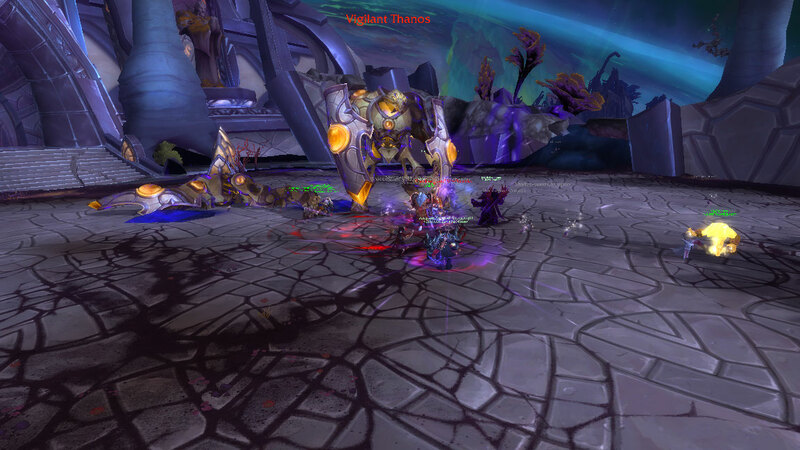 Vigilant Thanos rare mob can be found in Mac'Aree. Vigilant Thanos, along with Shadowcaster Voruun, have yet to appear on Mac'Aree as of 12 PM CST on 9/7/2017; the other rares on Mac'Aree have already been up multiple times. Given his proximity to the Seat of the Triumvirate, I wonder if Week 3's questing unlocks are required for him to show up. Drops the Mac'Aree Vigilant's Shield, which share a model with the old Adamantite Kite Shield and its ilk. This rare doesnt exist we haven't seen it spawn yet on Thrall.People are camping it and still haven't seen it if there is a spawn timer it must be extremely long or gated. 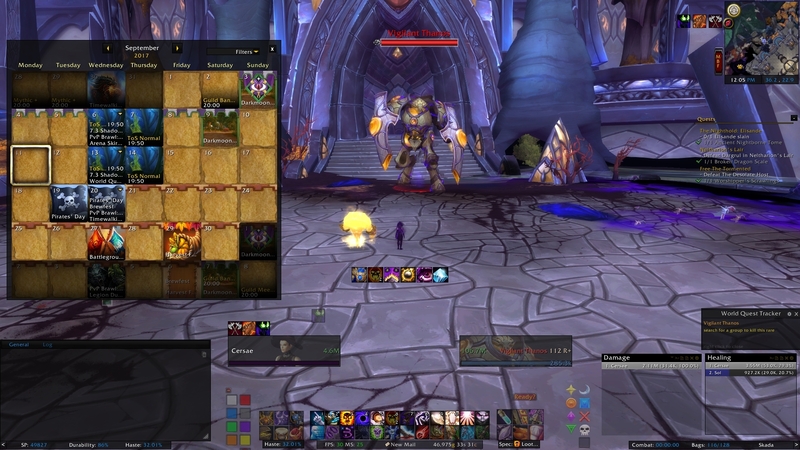 Turns out this guy does indeed have a world quest with him. Seems to be up on EU realms. There IS a World Quest to kill Vigilant Thanos. I had it today on Azuremyst EU server. Yesterday I was camping at his spawning place for about 4 hours. He did not spawn. He really has a long respawn timer when there is no world quest. Why didn't they have a Felguard with that name? At least the lower face would have fit. This guy must be pretty special, because the amount of hard-hitting trash you have to get through to get to him is ridiculous. This is one case where getting to the NPC can be worse than fighting the NPC if you're caught unawares. Start at the Shadowguard Incursion transporter, ride NNW and then NE. At about 30,30 the trash starts getting pretty thick, and together they cast some intense ranged dps, so you're going to take damage. Avoid water or anything else that can slow your speed. Keep going to approximately 35,23.5 and then use whatever aggro-cancelling ability you have. Equipping Prydaz, Xavaric's Magnum Opus before starting will absorb some of the damage and help you stay on your mount. He spawns on the stairs at roughly 37,24. This may be obvious to some, not to others...this guy is not visible until you get Mac'aree world quests open through the quest chain. Kill per day or you can kill how many times you want? Not a tough fight if you pop Lightforged Warframe spell (available from Matrix Core on Vindicaar). The problem is if you're going solo you have to trawl through a ton of elite mob types to get to him. Depending on how many you pull (sadly those closer to the boss are hard hitters & tend not to retreat) you may take a trip to the GY. Best to have some buddies with you. The lightforged warframe is really handy for jumping over the wall from Prophet's Reflection. It'll also last long enough for you to engage and kill the mob.